Styled with venta dress , equator legging and lolo mitten . my mom just had me order her one because she loved mine so much! Great design and quality. I love everything about it, especially the faux fur inside the hood and back - feels like being hugged by a teddy bear! I get compliments on it all the time. It fits perfectly, and has a slight taper at the waist so it's not shapeless like most down filled coats. The magnetic snap closures are also a dream. Zero complaints! So warm and soft. The magnetic closures on the front and pockets are great. But the ones on the sleeves get in the way sometimes. Great coat overall though. I bought this jacket because I wanted a lighter jacket than the community PARADIGM PARKA that I have but still have the warmth that a quality winter coat should have. This jacket has everything, I wanted and the color I got is really nice also, I got it in Cairo Gold. I usually wear small or medium but I got this in a large because the fit is slimmer and I still wanted room for layering if necessary. keeps me very warm in the super cold weTher this year! I’m a Californian that needs a warm jacket for travel. I took a chance on this jacket and I’m so glad I did. It’s so warm, but attractive. I’ve worn it for business as well as casual occasions. A great value too. I sized up one size and am glad I did. Keeps me warm in -30 Celsius weather, is long to cover my thighs and has a good shape! Only weird thing is the pockets since they are zipper closures but not a big deal. Super beautiful jacket, incredibly warm, only thing is it fits a little long, especially on the arms. It’s a warm jacket, also light weight. A bit big in arms and torso. But overall a good fit. Perfect coat for NYC winters. 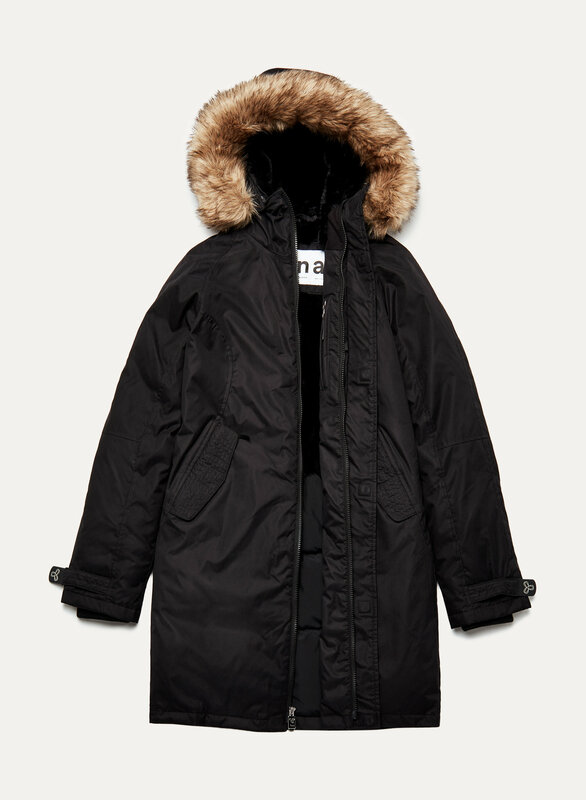 This parka is perfect! Warm, stylish and not bulky at all. 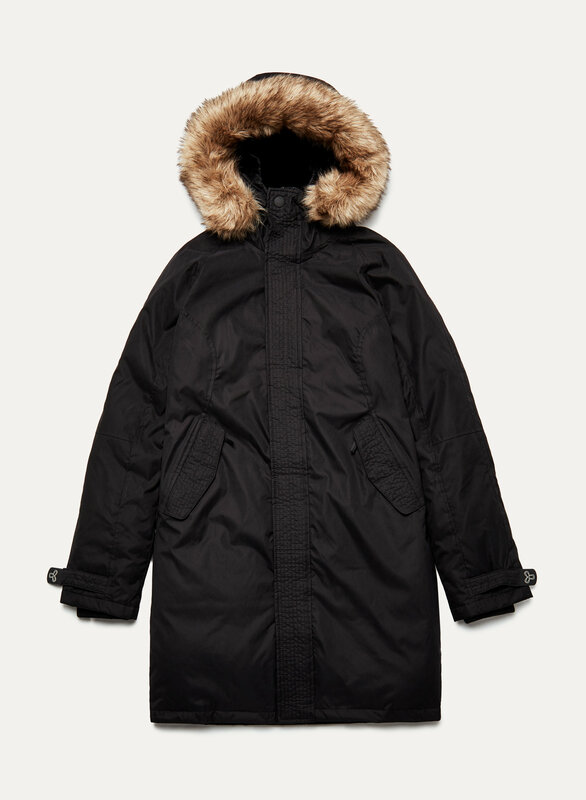 I have been buying parkas from Aritzia since my teens so 15 years now. I have always loved them and been able to hold on to a parka for years before needing a new one. They have always held up so well, and they are very warm! This time I bought "The Bancroft." I like it but I don't love it. I find this style fits smaller especially along the stitching along the back, shoulders and arms. I'm always afraid its going to rip. I have been buying size small for a long time I even tried on a medium and it still felt that way along the backside of the jacket. It just isn't as roomy as I feel the jackets used to be, it's hard to put a hoodie on underneath. I guess too slim fitting. I am 5'2 and a 130 lbs and it even feels tight along my hips. Although I know you can unzip from the bottom which is a neat feature but it takes away from trying to feel warm. I personally love the older styles I guess. otherwise I live the features this jacket has and all the pockets. It's so thin and light one can hardly tell its so warm inside. Absolutely love it. This coat is so comfortable, warm and great quality. My first time buying a coat from Aritzia and it won’t be my last. 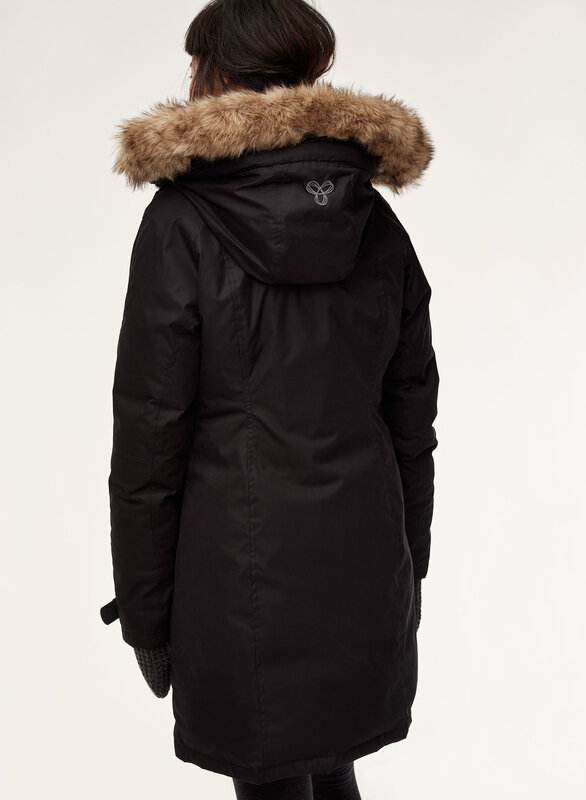 I asked a friend who lives in Toronto to recommend a warm parka for my daughter who is a freshman in college in Ithaca NY. It gets very cold in Ithaca but not as cold as Toronto so I went to the expert! She said the Summit TNA Parka was the best and I could not agree more!!!! My daughter loves it and the complaints about the cold have gone away! So thank you for making such a warm and stylish parka! This is my first aritzia parka and I had high expectation based on the good reviews. Unfortunately I realized this is a very poorly designed parka until after I wore it for a while. The material is so heavy that I feel I am wearing a sand bag. It's difficult even to raise my arms while go errands, not to mention to climb a mountain. I got sore arms and neck after wearing it for less than an hour! This is so sad as I love the rose mauve color and I was hoping to climb mountains wearing it because it's supposed to be the "summit" parka! Beautiful coat very well made and warm but fit larger than expected so I will be exchanging for a smaller size.. The inside is so soft, and snug! And its warm. Definitely great for the winter season, and just the right length! Keeps me nice and warm. I love that it’s both waterproof and wind proof. The fur on the inside in SO soft!! Like the cut and quality. It is very walm. Beautiful coat but too tight in shoulders and waist. Straight slim cut. I cannot go larger as it will be too long, so had to return it. Very sad. Loved the material and magnetic closures. It’s pretty warm at -10C. Let’s see when the weather gets to -20C to -30C how it holds up. I like the pockets with the zip and the sillouette. Might buy a second one in another colour. I received my parka about a week ago and I LOVE IT! it is very warming and sleek. it’s better than most of my other coats, but one thing that is misleading is the website qualities. it states that this coat is waterproof, but it clearly ISN’T! it is only water repellent... quite disappointing. but overall this coat is fairly good and i like it a lot. The fit is slim, exactly like it says, and fits true to size. I needed a parka that didn’t make me look puffy and was more feminine. This was perfect. The material is very warm and stylish. Amazing quality, which is what you’re paying for. I would definitely recommend this coat to a friend, and will honestly only buy my coats from Aritzia from here on out!! Exceeded my expectations. Exactly what I was hoping for. Gorgeous jacket! This jacket is worth every penny. Beautiful and functional. 10/10. Not a looser fit but I like that it is not too big and puffy. Super warm and love the length. Also love the magnets instead of buttons. Super warm parka. Worth the money. The soft inner lining adds extra comfort. The jacket is longer on me as I’m only 5’ but that is what I wanted for our cold winters. What a perfect jacket for walking the dogs on a cold day. The hood is nice and big...actually covers my whole head!!! Beautiful blush colour. 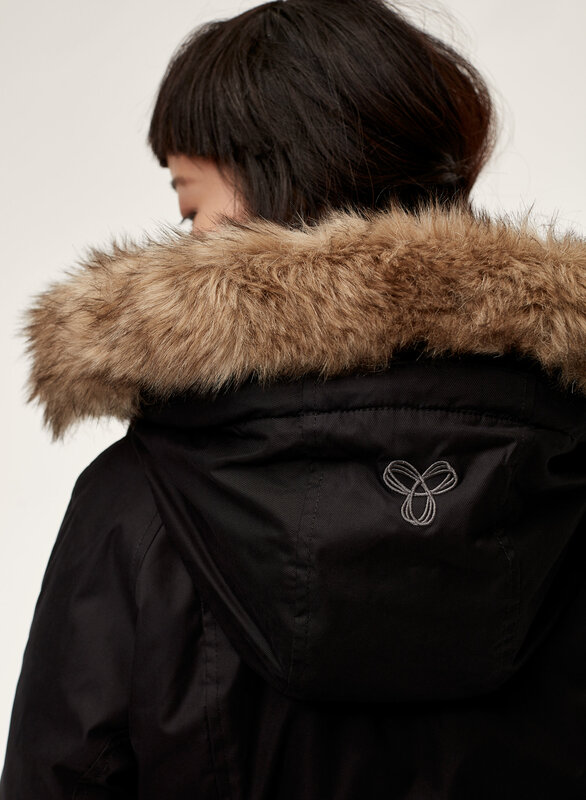 Flattering fit, true to size, colour is beautiful, fabric is nice, love the soft interior of the parka, love the magnet pocket closures, would definitely recommend to a friend. My daughter had the exact same coat in a smaller size and loved it so much that she wanted the exact same one in a larger size. The loves all the features, especially the magnetized buttons. The jacket is a perfect fit and definitely well worth the money spent on it. The material feels fantastic and comfortable. Even on my long commute drives there’s times where I don’t even have the heat on because i'm sweating from the warmth and insulation from the jacket.